Posted By:Unknown | At:2:38 PM Be the first to comment! ATLANTA — The Cain train has come to a stop. 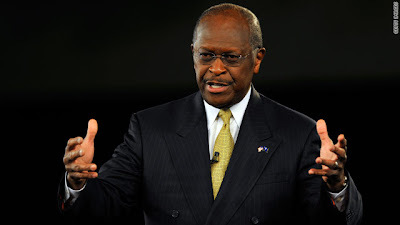 Republican candidate Herman Cain is suspending his bid for the Republican presidential nomination to avoid continued news coverage of allegations of sexual misconduct that is hurtful to his family. "I am suspending my presidential campaign because of the continued distractions and the continued hurt caused on me and my family," Cain told several hundred supporters gathered at what was to have been the opening of his national campaign headquarters. Cain returned to his suburban Atlanta home Friday and met with his wife, Gloria. It was the first time they have seen each other face to face since 46-year-old Ginger White came forward on Monday, and said she and Herman Cain had carried on a 13-year relationship. Campaign volunteers were keeping busy Friday night, tacking up signs at his headquarters. A contingent of Secret Service agents inspected the site in advance of Cain's arrival. "We are moving ahead," said Cain's Georgia director David McCleary, who said he had talked to the candidate earlier in the day and describe him as "upbeat." Cain, the former Godfather's Pizza chief executive who has never held elected office, rose to become an unexpected front-runner in the volatile Republican race just weeks ago. A self-styled outsider, Cain enjoyed strong tea party support from conservatives who viewed him as an alternative to former Massachusetts Gov. Mitt Romney. Polls suggest his popularity has suffered. A Des Moines Register poll released Friday showed Cain's support plunging, with backing from 8 percent of Republican caucus-goers in Iowa, compared with 23 percent a month ago. "I need to know that you are behind me 100 percent," Cain told backers. "In today's political environment, the only way we can gauge true support is by the willingness of our supporters to invest in this effort."